On the final day of one of Hollywood’s largest industry conferences, the D23 Expo—known to the legions that attend as the definitive all things Disney mega-event—one man stood there, alone and anonymous among the roughly 100,000 assembled fans. He was one of the entertainment industry’s biggest celebrities, if only briefly. German Vázquez, 65, a man of old-world formality who speaks broken English, blended easily into the overflow crowd as just another aging senior. Yet his story has the makings of a film that you will never see. He was born into poverty—though he would never call it that—in a Mexican pueblo as one of seven children. His father picked corn, and his mother was a homemaker. He came from nothing. Now, here he was, appearing in a video prepared by Disney’s massive storytelling team. It was the hand-crafted guitar of his own making, lovingly created in a workshop located on a street that has not always been among the safest in the city of Los Angeles, that was at the center of the Thanksgiving 2017 animated film release expected to be the box office hit of the season. 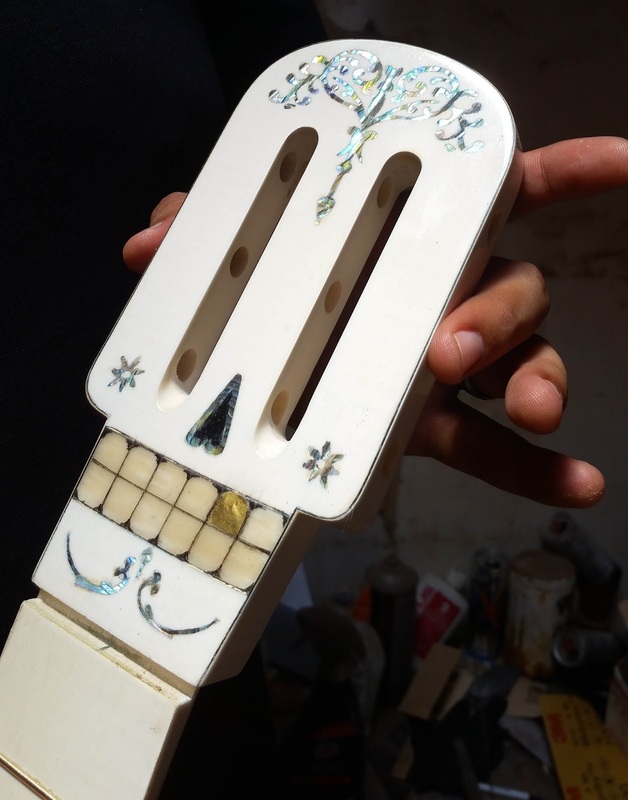 The video projection captured scenes of him working on the $12,000 limited-edition guitar replica from Pixar Animation Studio’s film, Coco. As an instrument that symbolizes the aspirations of a young boy and one that transports him into the land of the death, the guitar plays an essential role in the film. Since the guitar itself will gain notoriety through the million-dollar studio marketing efforts the film has marshaled, this account is meant to cast light on its maker, whose rags-to-riches story begins when Vázquez left school as a 6th-grade dropout. Growing up, Vázquez and his cousins would spend hours collecting and playing with the leftovers pieces of wood that this uncle, Manuel Rubio, discarded. It was in between games, Vázquez says, that Rubio began giving them tasks that emulated the steps of making real guitars. Paracho has a deep and storied musical history. In the 1500s, Bishop Vasco de Quiroga brought instructors to the region who taught the original indigenous inhabitant how to make stringed instruments as a way to convert them to Catholicism and to restore order to an area that had been ravaged by conflict during the Spanish conquest of Mexico. This knowledge was passed down through generations and, while some have taken advantage of the town’s reputation to market massed-produced, factory made poor quality instruments, others, like Vázquez, have continued to uphold the artisan tradition that make them the world’s most sought after master luthiers. “German has told me he can make a guitar using just this knife,” says Vazquez’s representative, Armand Arnazzi, while holding, with two hands, a rustic piece of metal wrapped in one end by granadillo wood. Vázquez and Arnazzi work out of a shop on Adams Boulevard where almost every business facade features bars on both the windows and doors. One has to wonder about the reasons for such measure, but the subject never really comes up. 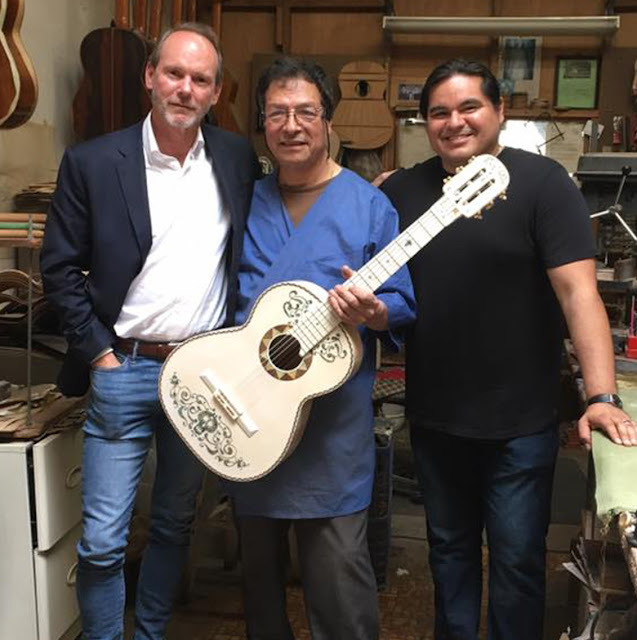 And a few weeks after the expo, they stand in this workshop, surrounded by a dozen or more unfinished guitars, reminiscing about the events that led Vázquez to the Coco guitar replica contract. Vázquez says that back in his hometown, the techniques he learned from his uncle earned him awards in local competitions and the reputation of being a solid woodworker, but that was not enough to earn him a decent living. At the age of 23, he headed to “El Norte” where he had heard he could continue making guitars and the pay would be better. An acquaintance who had promised him work helped him cross the border and brought him to Los Angeles. But Vázquez says this promise was short-lived because one day, soon after his arrival, this acquaintance drank a few too many and kicked him out during a drunken rage. That’s where Vázquez began his own business, in a small two-bedroom apartment shared with his wife, Silvia Vázquez, and their three kids. Silvia confesses that, at some point, she thought these arguments and the 10 to 12-hour days that Vázquez continues to devote to his guitars, would put a strain on their relationship. She says that today she is proud of his commitment to the instrument and the recognition he has received for his art. “[He] has a work ethic that I’ve never seen in anyone else in my life,” she says.